Every year, ROSS Companies holds an awards event which recaps the previous years’ accomplishments and recognizes our team members’ outstanding achievements. This year the event was held at Bethesda Blues & Jazz Club and highlighted customer service milestones and technological initiatives. The event included informative presentations from guest speakers, including Property Solutions, Inc. and SatisFacts. ROSS team members were encouraged to interact via social media throughout the event, including tweeting to a Twitter page specifically created for this occasion. 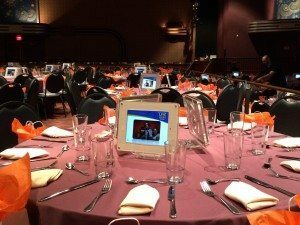 As a special treat, each guest table was decorated with interactive iPad centerpieces, which showcased a slide show of photos, interesting company facts, resident testimonials, and more. In addition, the iPad centerpieces were updated instantaneously with self-taken photos (selfies) and those taken by photographers throughout the event. Team members were able to share, e-mail, edit and print photos using the iPads. Entertainment during the event included trivia games, bingo, and music, which was chosen by team members via Twitter. In addition to receiving various awards and prizes, all team members walked away with cool swag bags. Some of the items in the bags included stylus pens, socket pockets, phone screen cleaners and more. The annual event is a fantastic opportunity for the company to gather and celebrate employees’ achievements. We are proud to recognize the following team members with their exceptional triumphs.